Have you thought about the non-baby items to stockpile to take care of YOU after your baby arrives? If you’re expecting a baby soon, it’s likely you’ve already stocked up on all sorts of baby items. Diapers, clothing, baby food…the list goes on and on! While it’s great to have everything that the baby will need once he/she arrives, it’s also important to make sure that you and the rest of your family have everything they need! Here are 7 non-baby items to stockpile. You’ll thank us later! What other non-baby items would you recommend that new moms stockpile before baby comes? Share below! No one likes to be hungry! But with a new baby in the house, you can expect that there isn’t enough time or energy to cook healthy and hearty meals. During the last few months of your pregnancy, stock up on freezer meals. These meals can be easily reheated and require very little effort. Be sure to have enough for you and the family! 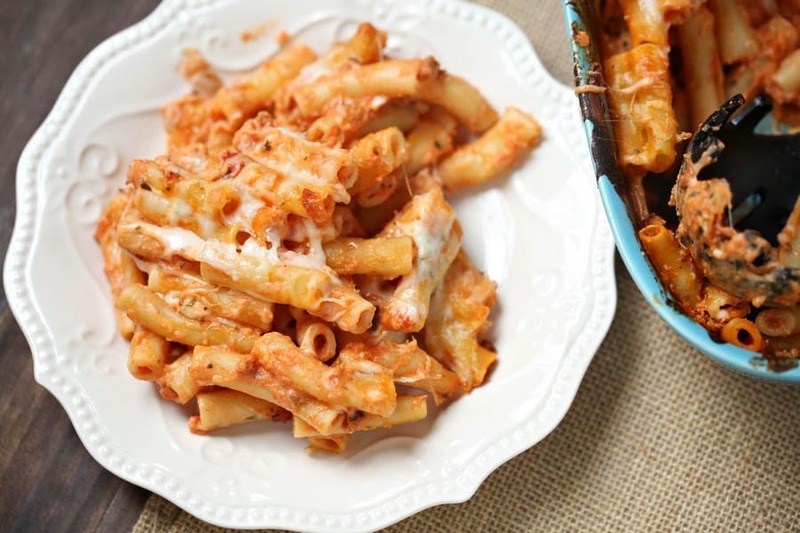 Take advantage of those “nesting” feelings and spend an afternoon whipping up easy casseroles, like our baked ziti. Or, even better, enlist help from friends and family and have them make a few freezer meals for you! Many moms (and dads!) are pretty hungry once pregnancy is done and over with. Snacks are perfect for those late night breastfeeding sessions or for when you need a quick pick me up. 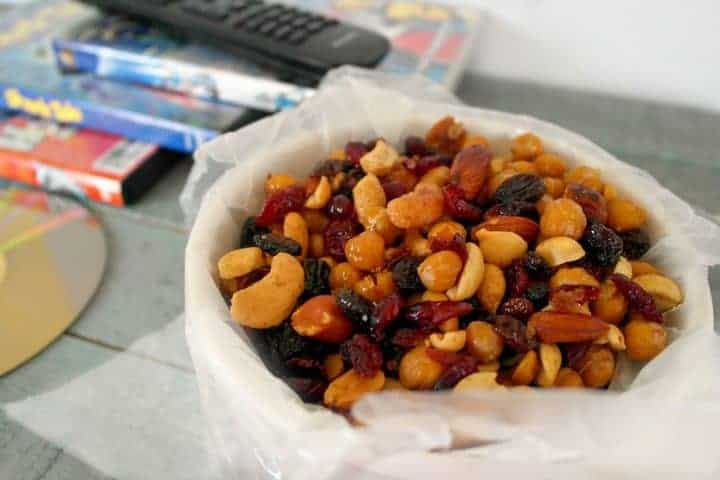 Stock up on quick grab-and-go healthy snacks from the store, or make a few of your own. Our Honey Roasted Chick Pea Snack Mix is packed with protein, easy to make and oh-so delicious! 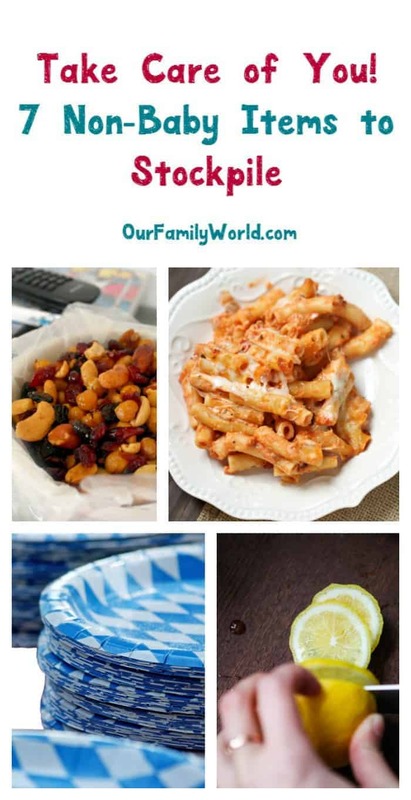 Whether you’re cooking from scratch or going the freezer meal option, paper plates are the way to go! There are so many eco-friendly paper plate options out there now, so you don’t have to feel bad about using them for every meal. Having as minimal dishes as possible makes life a lot easier. It’s always nice to eat without having extra work afterwards! With a new baby in the house, you can count on there being a lot of laundry to do! Babies go through clothes like crazy so have plenty of laundry detergent on hand. Otherwise you’ll be running to the store a lot. Make sure you get detergent that doesn’t have any dyes or fragrances in it. You can wash your whole family’s clothes in it so you’re not stocking up on two different types of detergent. If you really can’t go without that “fresh from the laundry” scent, use fabric softener on your clothes (but skip it for your baby’s stuff for now). Pads, breast pads , creams and pain relievers are must haves during and after pregnancy. With so many physical changes to your body, mom supplies will surely come in handy for weeks to come. Before and after pregnancy, the thing you’re going to want the most is to be comfortable! Be sure you have a solid amount of clothes that you can comfortably lounge in, either around the house or when you need to make a trip to the store. Just like clothes get dirty, with a new baby, you can expect the house to get dirty much quicker than it ever used to. Stockpile your cabinet with safe and natural cleaning supplies to keep your house clean. There are several companies that specialize in products that are non-toxic, which can ease your worries! You can also make your own, or stock up on the essentials to do it on the fly. Keep things like lemons, baking soda and white vinegar handy. You would be surprised at how many things those three simple ingredients can tackle around the home! Really great Mom tips! Stockpile lots of things like shampoo and lotion and face wash, etc…because it is so easy to forget things when you feel like a hectic Mom. Lol! Lotion, and bubble bath! Japanese Cherry Blossom from Bath and Body Works is my favorite! Freezing food saved me. People brought food the first week, but I relied on my freezer after that. Yes, these are all great things to stockpile. I especially like the idea of all natural cleaners. I have known some people whose kids got into their cleaner when they were young. Luckily, no injuries, but some scary moments for sure. These look like some good essentials to have to make things in the household work more efficiently. I know reducing the dish load alone is a big help to freeing up some time. Stocking up on freezer meals is definitely a great thing when you have a baby. This is a great list! My daughter is 8 months old so this is all still fresh and I can say you are spot on with your recommendations! Freezer meals were lifesavers for us in the early days. For as long as I can remember my mother and I have always made gift baskets that included not only items for mom and the baby, but things like this which are often needed, but forgotten. These are such great tips! I so need to start making more freezer meals. Such great tips!! I wish I would have prepared meals ahead of time, I do regret that. I wish I would have thought to make freezer meals ahead of time before I birthed my babies. It would have really helped save a bit of my sanity back then! These sound like some must have things stockpiled I’m sure parents to be often forget about their own needs in the rush of getting everything baby ready. Freezer meals! Freezer meals are everything! We stuffed our freezer full of them before I had my kids, and it was a life saver. Having a few extra freezer meals is going to help a lot on those busy days. It’s always good to have some natural cleaning supplies that are safer for babies and pets too. This is such a great post. We always think about what to get to prepare our homes for our kiddos. But what we never think of is how we’re going to take care of ourselves. We made a bunch of freezer meals before my daughter delivered. It’s a good idea. My house isn’t a storage facility, so I can’t really stockpile any of those things except the freezer meals. I wish I had the room to store more.